"RUSH was formed back in 1968 by Alex Lifeson, Jeff Jones, and John Rutsey. Jones was soon replaced by Geddy Lee and the band would see several lineup changes and a couple of name changes until solidifying the Lifeson/Lee/Rutsey lineup in 1971. 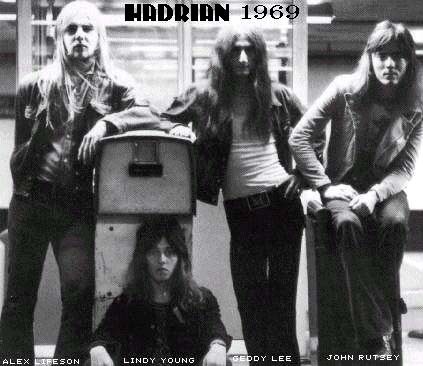 One of these incarnations was a band called HADRIAN, which was in existence from January through July of 1969. From January to May of that year Hadrian consisted of Geddy Lee on lead vocals and bass, Alex Lifeson on lead guitar, Lindy Young (Geddy's now brother-in-law) on keyboards and rhythm guitar, and John Rutsey on drums. There's been a photo of this lineup of Hadrian floating around the internet for years. In May of 1969, Geddy Lee was replaced by Joe Perna on bass/vocals for a couple of months before Hadrian broke up in July. I'd never seen a photo of this lineup and didn't know whether one even existed until reader RushFanForever recently discovered one while doing a Google image search. It came up on a genealogical page for the descendants of Salomon and Lydia Lindman (apparently these were Lindy Young's great grandparents). And here is the photo (at left, click to enlarge). I have no reason to doubt the authenticity of this photo, and the images of Lifeson, Young and Rutsey certainly bear a resemblance to the trio from the earlier Hadrian photo, albeit with shorter hair. As an added bonus there's also this photo of Geddy's wife Nancy, Lindy and their sister Barbara with their mother Louise from 2006. Very interesting stuff."